Gum treatments prevent minor gum problems from turning into more serious issues, and can also protect the gums from the development of more problems. The key to gum treatments is to have them as soon as possible – while the gum problem is at its earliest stage so that complicated treatments and problems can be avoided. There are a number of gum treatments that can be used, depending on the gum problem that needs to be addressed. Gingivitis – The mildest form of gum problem, this is characterised by gums that are swollen, red, and easily bleed. Gingivitis is most commonly caused by poor dental hygiene practises, but it can also be caused by smoking, taking certain medicines, and as a symptom of other medical conditions. Periodontitis – Gingivitis that is not treated in its early stages, and is allowed to progress, turns into periodontitis. It is characterised by the formation of a pocket separating the teeth and the gums, a space that can easily become filled with bacteria and plaque. Periodontitis can result to loose teeth, and may even lead to tooth loss if left untreated. Poor Oral Hygiene – This is the most common cause of gum problems. Plaque can accumulate on the teeth, and bacteria can multiply, when teeth are not properly brushed. Aside from improper tooth brushing, not going to the dentist for regular checkups can also lead to gum problems; an imbalanced diet can also contribute to the development of gum problems. Age – Studies show that gum problems are more prevalent with older people, especially if good oral hygiene is not maintained. Smoking – The use of tobacco products increases the risk of developing not only gum problems, but also lung disease, heart disease, cancer, and diseases that involve other parts of the body. Gingivitis can rapidly progress into periodontitis in cases when smoking or tobacco use is done by the patient. Stress – High levels of stress can make the body susceptible to infections, and can increase the risk of developing periodontal disease. Teeth Grinding – Gum tissue may weaken when exposed to intense force from chronic teeth grinding or teeth clenching; when these supporting tissues become weak, they are more susceptible to gum disease development. Medications – Certain medications can affect dental health, and may cause the gums to become more sensitive and turn weak. Anti-depressants, medications for heart diseases, and oral contraceptives are just some of the medications that can affect gum health. Medical Conditions – Systemic diseases such as rheumatoid arthritis, diabetes, and heart ailments may contribute to the progression of gum disease. Deep Cleaning Treatments – A deep cleaning treatment such as scaling is done to remove tartar above and below the gum line. 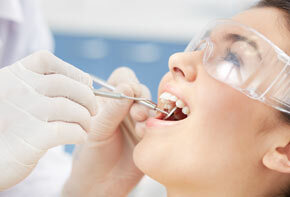 Another deep cleaning treatment is root planing, which removes rough spots, germs, and bacteria on the tooth root. Medications – Medications and prescription dental health products may be used in combination with deep cleaning treatments. These medications include oral antibiotics, antibiotic mouth wash, and antibiotic gels. Surgical Treatments – Gum or periodontal surgery is done when deep cleaning treatments or medications are determined to be insufficient to deal with a gum problem, and the only course of action that can treat the gum disease is surgery. Surgical treatments for gum problems include surgically lifting the gums to remove tartar deposits from underneath, gum pocket reduction through surgery, soft tissue (gum) grafting, and bone grafting. Surgical cosmetic dentistry procedures (such as a crown lengthening procedure) may also be done to improve both the form and function of the gums. There are a number of gum treatments available, depending on the specific gum problem that needs to be resolved. Your dentist will determine what treatment is required to make sure that the issue is addressed before it can progress into something more serious and more complicated to treat. Non-Surgical Gum Treatment – Non-surgical or non-invasive gum treatments include deep cleaning procedures that are used for mild gum problems. These treatments involve the removal of plaque from above and below the gum line, as well as the removal of bacteria and germs from the tooth root. Scaling and root planing are examples of non-surgical gum treatment. Surgical Gum Treatment – Gum problems that have progressed and cannot be treated by non-surgical procedures may need to be addressed with surgical treatments. These more advanced options make sure that the gums and the teeth are saved from further complications, and to prevent tooth loss. Examples of surgical gum treatments include: soft tissue or gum grafts, gum pocket reduction, and crown lengthening procedures.